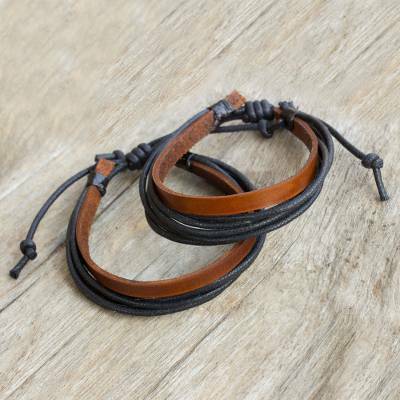 Brown Leather and Black Cotton Bracelets for Men (Pair), "Bold Contrast"
Handsome and bold, these bracelets for men contrast supple brown leather with black cotton cords. Chaloemphon crafts them by hand in a trendy and versatile set of two. The length can be adjusted by sliding the knots along the cords. You can find men's leather wristband bracelets 'Bold Contrast' (pair) by Chaloemphon in jewelry categories such as No Stone Bracelets, Cotton Bracelets, Leather Bracelets and Wristband Bracelets. Enjoy exploring these sections for other Novica treasures. Once again I recieve a greatly crafted bracelet form this artisan. Looks good and is very well made. Thank you again. ?Noi?, thank you, you made me a star. ????????????????????????? I ordered these for my twins and husband and chose them primarily for colours, materials and understatement.